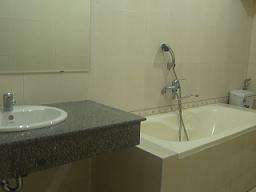 BODEGA Hotel is also a backpacker accommodation, Considered a most reliable destination for any tourist or businessperson, it takes just takes 35 minutes from the Noi Bai Airport, 05 minutes walk to the Hoan Kiem Lake as well as a beautiful area to relax and visit night markets in the 36 ancient streets. Although our hotel is situated in the crowded old streets, our hotel rooms are very quiet at night. The deluxe French 19th century finished rooms are also noise resistant. Presently we are delighted to provide any tour information's in the all regions of Viet Nam, beside that we could offer many different packaged tours from the north to the south. Especially, the independent or group tours to Ha Long and Sa Pa are available everyday. After a pleasant day of touring, you may feel a little bit tired, so you will be served a cup of refreshing tea or coffee free of charge. Please come to discover our motto: "BODEGA HOTEL, YOUR FAMILY IN VIET NAM"
We guarantee that the above-mentioned slogan will reflect our real services. Dream the night away ! 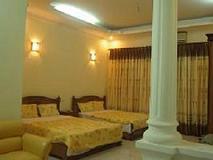 Enjoy the best of what Hanoi can offer while being assured of perfectly designed rooms and excellent service . 22 comfortable rooms and suites with pine wood furnishings, located around spectacularly panoramic view of the old quarter to ensure you enjoy a comfortable stay in Hanoi. A cosy and friendly restaurant, which is opened for 24 hours and especially, the breakfast is served to start at 7AM to 10 AM, where offering you different kinds of food and drinks for breakfast. Featuring Traditional North Vietnamese Cuisine--listed in the Lonely Planet. Free pick up from Noibai International airport to hotel applied for booking of at least three nights stay. 100% refund for 24 hours cancel before arrival date. 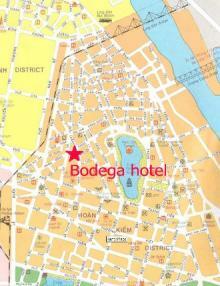 Bodega hotel is Centrally located in Hanoi's old quarter. Added at 133 HangBong Str, Hoan Kiem Dist . Bodega hotel has perfect location just steps to Hoan Kiem lake, Ngoc Son temple, Thang Long Water puppet theater, ANZ bank, Hanoi well-known restaurants.